I purchased buckwheat groats at Natural Grocers/Vitamin Cottage a couple weeks ago and didn’t notice they were the toasted groat variety until I got home. I was originially looking for the raw version to grind my own flour but came up with plan B with this granola. (Maybe I can use the toasted version in similar ways but until now, I have only experimented with buckwheat flour). If you have never had toasted buckwheat groats, they are crunchy and nutty, and would add great texture to any homemade bar recipe (granola, snack bar, protein bar) and I knew they would be a perfect addition to homemade granola! 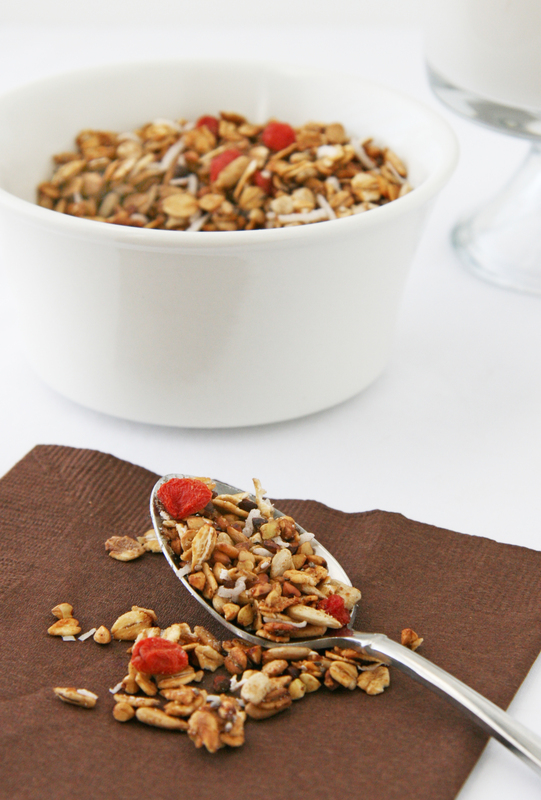 This recipe was inspired by Kath’s Buckwheat Granola over at her amazing blog, Kath Eats Real Food! With this recipe, you only have to dirty ONE dish. How great is that? You can bake the granola in the same pan that you mix all of the ingredients – easy peasy! 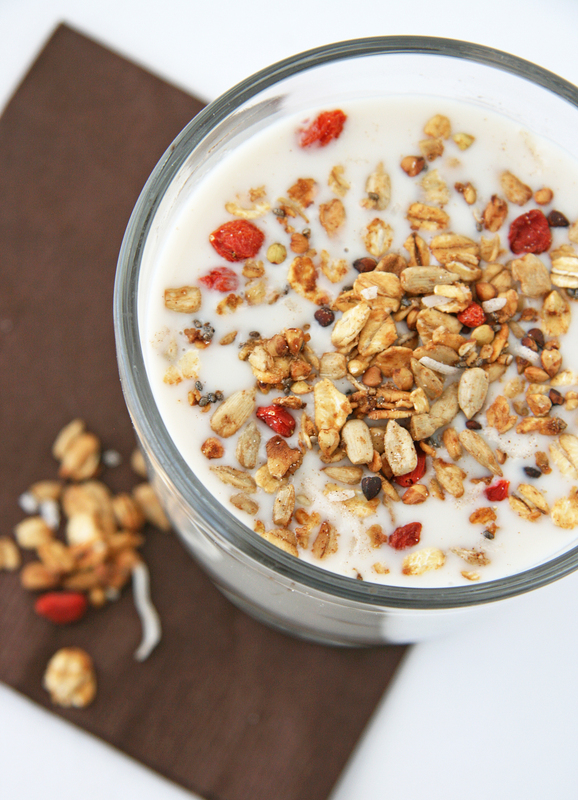 I enjoy this lightly-sweetened granola plain, straight from the jar but also add it in almond or coconut milk as a cereal or in a yogurt parfait with chopped up fruit. This is a great base for granola so feel fee to substitute nuts, seeds, dried fruit to your liking as well as different spices and sweetener – Pecans, almonds, apricots, chopped fig, dates, flaxseed, cherries, blueberries would all be good additions or substitutions! If you are feeling extra indulgent, add some chocolate chips, chunks or cacao nibs for a chocolately treat! 2. In a loaf pan or oven-safe bowl, combine all ingredients except for the add-ins (coconut and fruit) and stir to combine. 3. Bake for one hour in the loaf pan or metal bowl, stirring every 30 minutes. Color should be golden brown. 4. Remove from oven and stir in the goji berries and coconut, which will slightly toast when you add to the hot ingredients. 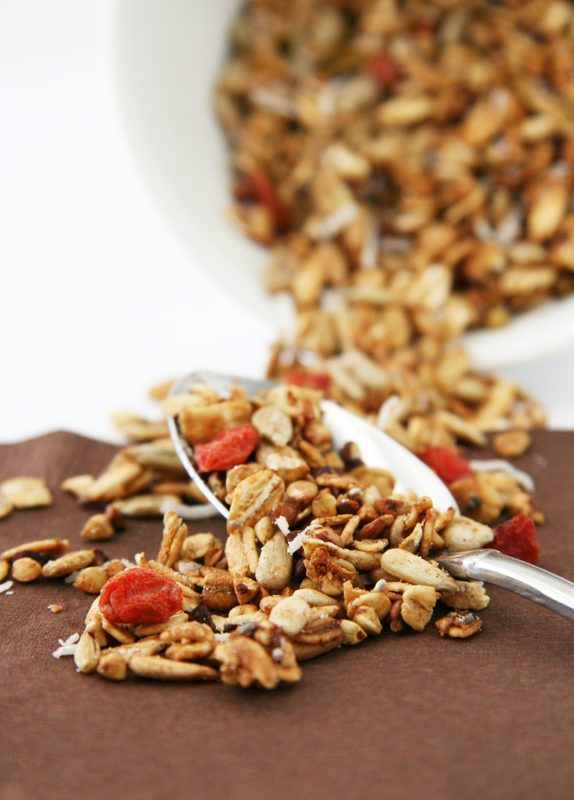 Stir every half our or so while cooling – the granola will clump together some. It’s ok if some of the mixture sticks to the bottom of your pan as well. Enjoy!